We’d love your help. Let us know what’s wrong with this preview of Ghostly Writes Anthology 2016 by Claire Plaisted. 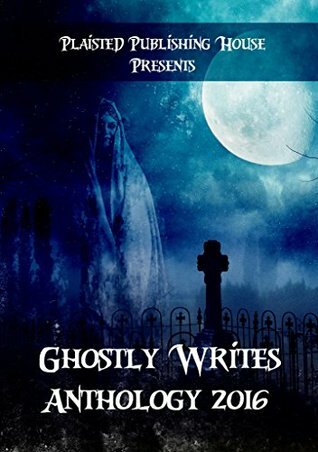 Enter the chilling Ghostly Writes Anthology and be prepared to be scared with 27 short stories from around the world. Creepy houses, murder mysteries, paranormal and much more to haunt and thrill those who dare. To ask other readers questions about Ghostly Writes Anthology 2016, please sign up. This collection of stories from various authors contains a wide range of tales. Some creepy, some amusing, and some just plain strange. Though there are some editing issues, I enjoyed diving in and immersing myself in each story. My favorites had to be "Mother Called Today" and "Ruby Kisses." If you like ghost stories, you'll be entertained by this excellent creepy collection of short stories from a wide variety of authors. Some stories were scarier than others, but they were all well-written and most held my interest. As is usual with the variety of tales in anthologies, I found some of them more enjoyable than others. In fairness to all the authors involved, I'm finding it difficult to choose only one or two favourites, although Cabins by JB Taylor, Canvas by Sarah Moiser, Hello Dear If you like ghost stories, you'll be entertained by this excellent creepy collection of short stories from a wide variety of authors. I have a mixed review. Some of the stories were well written and I would love to read more. Others were disjointed or confusing, while readable, I was glad to finish them. I have several names I will be looking out for in the future. The thought of a collection of ghostly shorts was extremely appealing, so I downloaded this one as a freebie. This collection seems to be a project of some writing class, since many of the stories contain the same elements (an old house recently willed to someone who discovers spirit possesion, or angels with a mission). While a few of the stories contained within are well done, the book as a whole needs a MAJOR edit. A fine collection of diverse and colourful stories, that explore many different aspects of the genre. All are enjoyable, with Claire Plaisted's own effort among the highlights. Not every story will suit every taste, but all are well crafted and the standard is amazing. Like with most anthologies of this sort, there were stories I enjoyed more than others. Some of the stories were really good, some of them were just OK, and others might have appealed to me more if they hadn't ended with the words "to be continued" and a cliffhanger. Overall though, this is a fun and creepy read. Lots of short stories enclosed. Actually lost count how many there was. Would be ideal to have this book to go to when you have a spare hour or so and read a few short stories or when another book doesn't take your fancy. I read the book start to end however in one and very much enjoyed it. All the stories are engaging and a good reads. Well worth the download. A collection of creepy mysteries that will keep you up at night. These short stories were all written by different authors with an eclectic mix of writing styles. Some I enjoyed more than others. There were editing issues but I continued to read easily enough. There were complete stories and others that stated at the end - to be continued. The problem with this is that a reader may forget all about this book unless the author puts in a link directly to the full novel so that the reader can get to A collection of creepy mysteries that will keep you up at night. These short stories were all written by different authors with an eclectic mix of writing styles. There were complete stories and others that stated at the end - to be continued. The problem with this is that a reader may forget all about this book unless the author puts in a link directly to the full novel so that the reader can get to it directly to continue. Claire Plaisted grew up in the small historical town of Sandbach, Cheshire, England with two older siblings and loving parents. At 19 she moved to the town of Colwyn Bay in North Wales and it was from here that her adventures began with her first holiday abroad on her own at age 21. New Zealand was the destination and this is where she met her husband to be and eventually moved to in 1991. Married Claire Plaisted grew up in the small historical town of Sandbach, Cheshire, England with two older siblings and loving parents. Married with four children, sadly losing their youngest child. Claire engages her time in bringing up her children along with family history research. Starting a small hobby business in 2010 to format and print Family History Books for people. It was during the formatting of one book Claire opened a word document while waiting on receiving information to finish her latest project. Her first novel was born. Though this Regency Mystery Romance novel is yet un-published Claire learnt a lot about the writing world.